We determined the temporal dynamic of cambial activity and xylem development of stone pine (Pinus cembra L.) throughout the treeline ecotone. Repeated micro-sampling of the developing tree ring was carried out during the growing seasons 2006 and 2007 at the timberline (1,950 m a.s.l. ), treeline (2,110 m a.s.l.) and within the krummholz belt (2,180 m a.s.l.) and the influence of climate variables on intra-annual wood formation was determined. At the beginning of both growing seasons, highest numbers of cambial and enlarging cells were observed at the treeline. Soil temperatures at time of initiation of cambial activity were c. 1.5°C higher at treeline (open canopy) compared to timberline (closed canopy), suggesting that a threshold root-zone temperature is involved in triggering onset of above ground stem growth. The rate of xylem cell production determined in two weekly intervals during June through August 2006–2007 was significantly correlated with air temperature (temperature sums expressed as degree-days and mean daily maximum temperature) at the timberline only. Lack of significant relationships between tracheid production and temperature variables at the treeline and within the krummholz belt support past dendroclimatological studies that more extreme environmental conditions (e.g., wind exposure, frost desiccation, late frost) increasingly control tree growth above timberline. 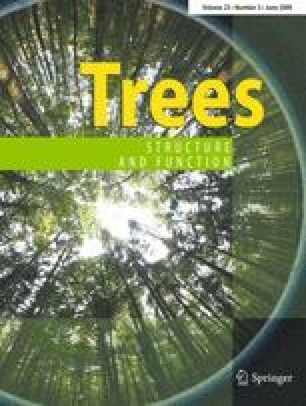 Results of this study revealed that spatial and temporal (i.e., year-to-year) variability in timing and dynamic of wood formation of P. cembra is strongly influenced by local site factors within the treeline ecotone and the dynamics of seasonal temperature variation, respectively. This work was supported by the Austrian Science Fund (Project No. FWF P18819-B03 “Temperature dependence of Pinus cembra (L.) stem growth and respiration along an altitudinal transect”). Precipitation data were provided by Zentralanstalt für Meteorologie und Geodynamik, Innsbruck, which is greatly acknowledged. We also thank anonymous reviewers for valuable suggestions and comments on improving the manuscript.